Relax . . . We've got a promotional gift idea that's sure to spruce up your next marketing campaign! This emery board is made up of 2 types of files on each piece; a nail file and a buffer (less abrasive). 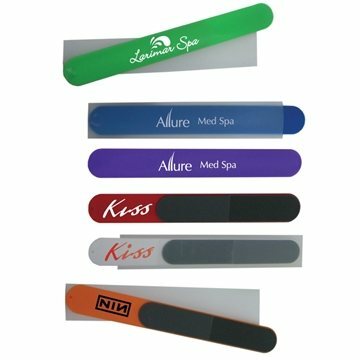 With a recessed grip on the back and a variety of color options to choose from, this manicure tool makes a great giveaway for beauty salons, hotels and spas. It would also be a creative promotion idea for florists and landscapers too! It is super easy to buy from Anypromo. Nice quality and the printing looks great. the product was very professional. There wasn't anything I didn't like. I purchased the red ornament and it looks just like glass. You cannot tell the difference. I would highly recommend this product. We have always recieved our orders in a timely manner and have had nothing but good experiences with your company. I love the quality! I thought the logo would be a little larger. But I love it. All of the detail within our logo came out Perfect!